This beauty is Agastache rupestris, also sometimes called Sunset Hyssop or Apache Sunset. It is great dryland garden plant because it thrives in our dry clay soil of southern Colorado, but it is something that will grow in many different climates and soil types. It does prefer full sun. I’ve coaxed it into growing in part shade, but it is not as happy. 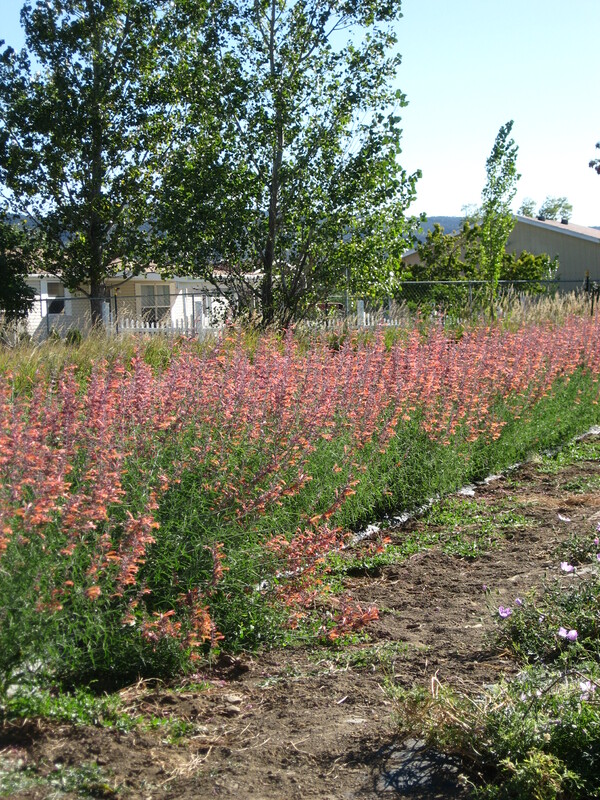 We have a 100 foot bed of Agastache rupestris growing in our production field and it is stunning when it is in full bloom! Agastache rupestris smells and tastes incredible…some would describe the fragrance to be minty, but at the same time with a licorice root beer twist and the taste is similar. The flowers are fully edible and are quite delicious added to salads, fruit dishes, used to decorate cakes, mix with cream cheese or butter as a sweet tasting spread for pancakes, bagels, etc. It also makes a very delicious herbal tea. Our favorite way to prepare it is as an herbal honey. There are directions for making an herbal honey on the herb information page of this blog. Speaking of herbal honey, that same culinary honey has some medicinal benefits too. It can be used as a soothing sore throat syrup and the tea is good for encouraging good digestion. As a bonus, this plant is grand at attracting hummingbirds into your garden, as are the other members of the Agastache group like Coronado Mint(Agastache aurantiaca), Anise Hyssop(Agastahce foeniculium) and Double Bubble Gum Mint (Agastache cana). Those little winged ones love the bright pinks, apricots, purples and so on of the flower color! This evening as I was coming in from work in the greenhouses, I counted at least 23 deer, with their king stag buck, hanging out in the compound around our home and in our hay pasture just south of our driveway. The group included three youngsters that were born this spring (a set of twins and a single fawn), and three young bucks, two of which are two years old and the other one is three years old. The young bucks were seriously practicing their fighting skills with one another. The whole group was causing a lot of traffic interest as folks were driving home from work and slowed down or stopped to watch the group. I watched too for a good long while from my back porch. It was a pleasant way to end my work day.